Casa Rosa is among the most exquisite rental properties in the entire Mayan Riviera, and by far one of the premier homes in Tankah and Soliman Bays. We have a newly remodeled kitched with granite counters, professional gas stove and premier knive's and cookware. We are among the most accessible, with the most privacy, the best and largest pure sand beach, the most gorgeous pool, and the most elegant and well appointed interior. We have three magnificent outdoor dining and relaxing decks on each of our three stories, which provide ample and luxurious places to enjoy a meal, private sun bathing or star gazing with exceptional 360 degree views of the Mayan Riviera. BEACHFRONT: Casa Rosa is a beautiful beachfront villa located just north of Tulum, nestled on a bay known as Tankah Tres, on the Mayan Riviera, which is home to some of the prettiest beaches in the world. Casa Rosa's beachfront is among the most perfect in the bay, with 50 feet of crystal white sands leading into a tranquil bay with a coral reef which awaits kayakers and snorkelers. All the homes in Tankah Tres are on 1/2 acre lots, so there's peace and quiet. RELAXATION: The palm tree shaded house is less than 50 feet from the Caribbean and you can swim, snorkel, kayak or just play in the warm turquoise water, or take in the whole picturesque scene seated poolside. This relaxed luxury appeals to both children and adults! CONVENIENCE: Because we are situated between Akumal and Tulum and just off the main highway, Casa Rosa is a great home base for your Akumal, Tulum and Coba adventures. Akumal's famous turtle bay is 15 minutes to the north, Tulum's beachfront ruins and big beaches are just ten minutes away, while the stately Coba ruins are 40 minutes away, and the stunning Chichen-Itza is a 3 hour drive. A library, satellite cable TV, CD's and DVD's and wifi are all provided. Relax by the pool or nap beachside in a hammock or chaise lounge. If you are feeling athletic, there are 2 two person kayaks available for your enjoyment. Bring dive and/or snorkel gear (or rent it from the local dive shops) since Tankah contains a beautiful reef teaming with colorful fish, turtles, and rays. toilet, shower, There is a spacious bathroom downstairs for your guests. toilet, shower, There is a spacious Master bathroom upstairs. toilet, shower, There is a spacious Master bathroom downstairs. Casa Rosa's beach is among the best in the entire Tankah/Soliman Bay region. Compare us to any other property! We have 50 feet of crystal white sand extending from the edge of our sweeping deck to the shores of the ocean. Our beach is also free of the rocks that are prevalent in the bay - our beach and water access is just exceptional, making playing on the beach or swimming, snorkeling and kayaking in the bay a pleasure. Casa Rosa is situated on one of the most private, quiet and gorgeous locations within Tankah Tres, one of the most scenic and natural bays in the Mayan Riviera! 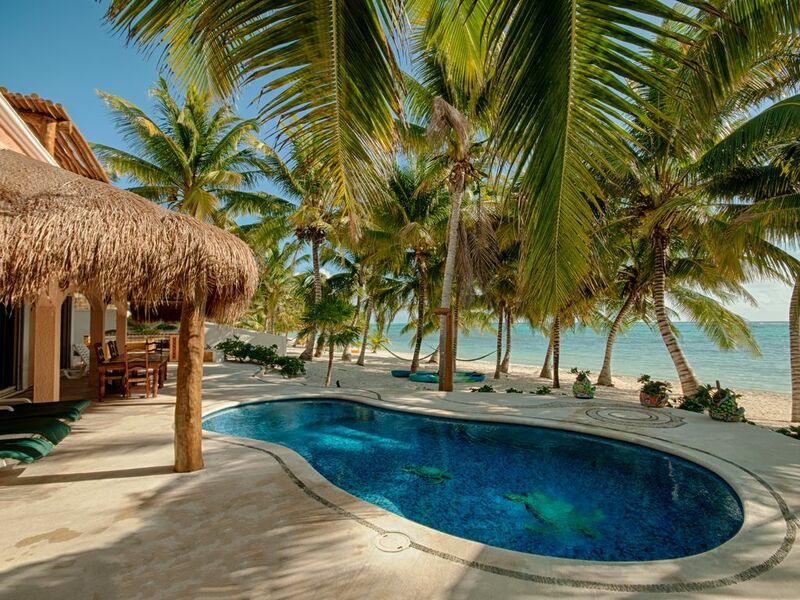 The house and pool are just 10 meters from the ocean and partially shaded by 14 lovely coconut palms. There's plenty of room for lounging in the hammocks, beach volleyball or playing in the sand. We're pleased to provide unlimited US and European calls on our Vonage phone. In addition, we provide a Mexican TelCel phone loaded with $10 for any local calls you would like to make. Each of the four bedrooms and the living and dining room has an LG air conditioner with a remote controller. Beach towels are provided for all our guests. We have a washer/dryer onsite and our housekeeper will be pleased to wash and fold your laundry for an additional charge of US $5.00 per load. Our kitchen is outfitted with Calphalon cookware, gas range, microwave, blenders, and drip coffee machines. It is sunny, and inviting - you'll spend many great times making coffee, grilling fish, and preparing margarita's here! The upstairs master suite and living room both have the latest high definition flat screen TV's with the largest available selection of English language Sky TV channels. Tons of CD's are provided for your listening pleasure. We have an extensive DVD library and provide DVD players with the each of the two TV's - feel free to bring your own movies as well. Casa Rosa's spacious outdoor pergola and shaded seating on the second floor is lovely! It has fantastic views of the coastline and is private yet elegant. There's an additional 3rd floor patio with unparalleled 360 degree views of the entire Mayan Riviera. It has seating for sun bathing, afternoon cocktails and star-gazing. It's fantastic up there with just you and the stars! We have two 2-person kayaks, along with life jackets, available for our guests to use in Tankah Bay. The custom tiled patio surrounds the pool and there are ample lounge chairs, rope swings, and hammocks. Additionally, there's outdoor seating for 8 at our Mexican tiled table: wonderful for poolside and beach side dining. Our wonderful fresh water pool is located in the patio just outside the house and nestled against the soft white Caribbean sands. Please note - it's very shallow - only 4 foot deep - so no diving! Casa Rosa has a fantastic fresh water pool and patio, an outside shaded poolside dining area, an upstairs patio and palapa, AC's in every room, 2-two person kayaks, hi-def flatscreen TVs and DVD players, stereo/CD/iPod players, satellite cable with every available English language channel, a well appointed kitchen including gas range, blender, coffee maker, juicer, and extensive cooking utensils, linens, bath and beach towels, an outdoor gas grill, badminton/volleyball set, shady palapas, private sunbathing terrace, lovely and caring housecleaner and gardener, and an English-speaking property manager who will ensure that every detail of your stay is well attended to so that you can enjoy your time at Casa Rosa. Casa Rosa is a wonderful place to stay. It is a well maintained house right on the beach. You walk out the back door to your own pool and only a few more steps to the beautiful ocean. It is so quiet and away from the main town that it sometimes feels like you are on your own personal beach. You are only a 5-10 minute walk down the beach from a couple restaurants, a small store, and even a cenote. Getting into town isn't difficult either without a car. Although expensive (~$15 each way) there are taxis near the guard shack that will take you into the Avenue tulum area (little shops, big markets, bars, restaurants). Or you can walk about 15 minutes down the entry road and get the collectivo van for $1/person (20 pesos). And then there is the hipster/yoga area of tulum, on the ocean. It is filled with beautiful, resort style hotels, bars, shops, restaurants (a lot of vegan options in this area). Also, the tulum ruins are worth a visit. Anyhow, I digress. The house is great. They have a great welcome book that explains everything. Maria, Bernardino, and Noel are wonderful and friendly. We highly recommend Casa Rosa, especially for families and groups. Definitely book this place! Thank you Nick and Jeff for sharing. Thanks so much for staying with us and for taking the time to write a review. I'm so pleased that you had a great time with us and that you were able to explore the area a bit. We are very grateful that our house is several km north of the Tulum scene, as fun as those amazing beaches, yoga, foodie and cenotes are, it's so nice to come home to such a tranquil place. Wonderful that you took various forms of transportation to town and thanks for sharing with others that it's very doable without a rental car. It is getting very congested on the beach strip in Tulum, so taking a taxi from the adjoining hotel is a good option. We're especially pleased that you loved the villa as much as we do, and that your time with Maria, Bernadino and Noel, our long time staff, was a plus. They all make our stays feel like we are at our home away from home, and they try to make all our guests feel that way too. Hope you'll be back for another visit and thank you again for letting other know about your stay with us. Great house right on the beach! We traveled with 6 adults and 3 kids to this house and it worked out well overall. Unfortunately, the pool was too cold to use, maybe if it wasn't so windy, the pool could have been refreshing? We planned on having the kids swim a lot to occupy the time but that didn't happen. We stayed in a similar area two years ago and had the same issue, maybe the pools are just not warm during the winter months. Maria (and Bernadino) cooked us a couple meals and they were DELICIOUS! I highly recommend her cooking for you. The hospitality was good, but I've had friendlier in other homes I've rented in Mexico and Central America. On Monday, when we first met Bernadino and Maria, they showed up with breakfast and lunch, although we did not request any meals. We were only going to have them make dinner one or two nights. Although the food was very good, we had plans for lunch that day and felt obligated to stay at the house to eat lunch because they said they had brought it and had to cook it. Also, the welcome booklet said two loads of laundry were included and an additional 50 pesos for each additional load. I set out laundry one morning where instructed and Maria told me she wouldn't do it until the next day, which was frustrating because I had one of my child's swimsuits in there that I needed washed. So when they grabbed it the next day, it was no more than 3 loads as it fit in a regular sized laundry basket. I paid Bernadino for the dinner and there was $10-15 extra and I said it's ok you can keep it and he told me that the laundry was $10 so it worked out. It should have been less than $3 if it was 3 loads. The Kayaks were great and the water was beautiful! We spent a lot of time in the hammocks as well. The kids (and adults :)) loved the swings, such a nice touch! The rooms were spacious with lots of closet space. All the bathrooms worked well and A/C was great when needed! We all slept very well! Security was fantastic as well. If the housekeeper was friendlier and the pool was warmer, I would have given it 5 stars! So glad you had an overall wonderful time at Casa Rosa. We strive to be the best possible home base for your travels to the Mayan Riviera. Especially glad that the meals were delicious and you enjoyed the kayaks and the pure crystal sand beach in front of the villa, leading into the tranquil waters of Tankah Bay. Apologies for the miscommunication on the laundry and the meals, but so relieved that it all worked out and the meals were delicious! Also, many apologies that the pool was not enjoyable. I'm not sure any pools in the area are heated, and from our and other guest's experiences, it's wonderful year round, so very sorry it was not enjoyable for you and your family. Thank you for your kind words and apologies for the inconveniences. We really enjoyed our stay at Casa Rosa. The house is a four bedroom 3 bathroom set up. All rooms are very nice size with air conditioning that works well. Our group was all impressed from day one on arrival as to get to the house you have to pass a security checkpoint a mile down the road and then you arrive the house front gate that is secured with coded door lock. There is also on site security from Noel. He does a great job watching over the property at night. That being said, we had absolutely no security issues. The place was very peaceful. The entry way is very nice and clean (Bernadino and Maria take very good care of the property). The house has fairly good wifi and satellite tv worked great (we only watched the super bowl). The kitchen was well stocked with cooking supplies. There is a gas grill out front. We had Maria and Bernadino cook a couple of meals that were excellent and they also went on a couple of grocery runs for us. Once you open the patio door out the back, there is a terrific breeze right through the house. The sea breeze each day was amazing. The pool was very clean and refreshing. The beach front area was well kept and the sand was soft. The hammocks are great to relax on. There are coconuts available from the trees in the back to make drinks with when they are ripe. Bernadino is a help with that. The water has some rock/coral on entry. There is some sea grass too. However, the snorkeling out from the house was amazing. I have paid for snorkel trips and gotten far less. There are a couple of really nice snorkeling reefs very close to the property. We saw sting rays, cuttlefish, angel fish, etc, etc,. It was excellent and a very easy activity. There is a cenote down the road that many people go to as well for another near snorkel excursion. We had a few meals out for dinner and breakfast. I recommend casa cenote or the tankah inn for breakfast. I also recommend going to Blue Sky just a bit further down from casa cenote for thieir wood fired pizza. It was fantastic. Bernadino ordered two taxis for our group to go to the Tulum ruins near by. If you want a relaxing getaway with family or a group of friends, I highly recommend Casa Rosa. Amazing vacation...can't wait to go back!!!! Stunning week on the beach. I can't say enough about what a great time my family had at Casa Rosa. The beach and pool area were spectacular. We found it hard to tear ourselves away to go the occasional day trip. The staff were a pleasure. Bernardino was quiet and non-intrusive, but more than happy to help us with our bad Spanish and split coconuts for the kids. Maria and Bernardino made us dinner one night...some of the BEST food we had in the area. Next time we will have them cook for us at least 2 nights (there were lots of leftovers as well). The house was super comfortable and well appointed. Not sure if the drapes were new, but they appeared so and blocked the early morning sun so I could sleep in a bit. Driving in the area was not a problem, as you stated in your guest book. It was super convenient being one of the first houses on the beach. The cenote farther down the road was super popular and glad we didn't have to contend with the divers and parking going on at the cenote very often. Found an amazing dive shop across the street from the cenote, with parking lot in front and next to Blue Sky Hotel, run by Miguel Beltran. I believe it is called Manatee Divers. $100 for a dive is a great price and he was an excellent dive master. Thanks for all the tips on places to eat in Tulum. We are ceviche fanatics and loved El Camello (almost out of town heading south on the main highway...on your left). Again, thanks for providing such an awesome house for us to enjoy!!! Our favorite place in ALL of Tankah Bay! We have traveled to Tankha Bay since 2007, and stayed at Casa Rosa our last 2 times. There simply is NO better location, beachfront and privacy for an authentic Mexican experience. Sure there are larger, more modern places but they lack the charming appeal of this amazing home. The kitchen remodel and outdoor grill/table were outstanding and well-used on our part! Bernardino, Maria and Noel are wonderful and helpful. Have Maria cook for you one (or more) nights for a special treat. The only request we would make is 1. A complete first aid kit and 2. A few plastic adirondak chairs for easy moves to the beach for reading. We'll be back! Thanks so much for your comments, so pleased you had a wonderful visit. We look forward to your next visit. My wife and I and our four "adult" children just returned from a week at Casa Rosa on beautiful Tankah Bay immediately north of Tulum. This property was precisely right for our group and "as advertised" in every respect. The house is generously sized with 4 ample bedrooms - two "master" suites (one down; one up) and two nicely appointed secondary bedrooms on the first floor. The kitchen is huge and well-equipped. The living area is comfortable. The house offers all the comforts of home. The air conditioning works very well - important for a trip like ours in August. The oceanfront terraces and decks are wonderful for relaxing during the day or in the evening. The pool is great for a quick dip to cool off or simply relax. The setting in a small grove of coconut palms with hammocks strung between a couple is idyllic in every way. The staff is wonderful. Bernardino is the groundskeeper and general all-around go-to-guy for whatever you need - including a refreshing coconut drink right out of the nut he's pulled off one of the trees on the beach. Maria does a great job keeping things inside and out spotless and fresh towels in the bathrooms (there are 3 - with plenty of hot water). We didn't get a chance to sample one of Maria's meals (we understand they're wonderful) because we found too many great places in Tulum to eat, but we arrived to find a big batch of freshly made guacamole and Pico de Gallo in the frig along with a bag of chips - all very welcome since we didn't arrive to the house until 8:00 PM on our day or arrival (we asked her to repeat the guacamole, which she did to perfection). From sundown to sunrise, Noel patrols the grounds, keeping an eye out for security and for any nesting or hatching sea turtles (and making really cute crafts from palm fronds). Being there in August, we had the possibility of seeing turtles nest or hatch. The hatching usually occurs during the dead of night. When we arrived, we found the beach in front of the house and north and south literally covered with turtle nesting spots (each carefully marked and dated). Amazingly, two of those nests right in front of Casa Rosa hatched in the early evening while it was still light and we witnessed the most amazing spectacle of literally hundred of little turtles (200 +/- per next) coming up out of the sand and heading straight to the water. We've never seen anything like it before and will never forget it. In short, I can't recommend Casa Rosa more highly. The Mayan Riviera is your gateway to unlimited adventures. Our favorite activities include exploring cenotes, adventures parks, visiting Mayan ruins, birding, cave diving, golfing, yoga, para-sailing, snorkeling, diving, exploring Sian Ka'an, finding boutique restaurants and bars, and relaxing on our perfect soft crystal sand beach.